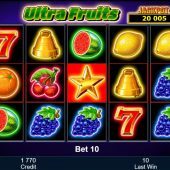 When I first saw Ultra Fruits slot I was a little dismayed thinking it was likely going to be another ordinary Novo Power Stars type game or a basic stacked fruits one such as Sizzling Hot Deluxe. Fortunately I was wrong and despite the simple and oft-used graphics and the trademark wheedle-and-trot sounds reminiscent of most of their slots, we have a new formula at play here. When we see the potential of this game, these fruits could quite possibly sweeten your balance - significantly! The grid at first appears to be entirely normal with the 5x3 pattern, but in fact all 15 positions are individual reels, similar to what you may have seen on games like Jack Hammer and Barber Shop Uncut. The second point is that unlike those games which need a winning line, Ultra Fruits pays all awards scattered and you need 4 in view anywhere of the top two symbols and 5 of the rest. To give an idea of the awards I will cover the lowest and highest award of each icon: 5 scatters (Star) awards 300x your 10-coin bet and these only appear on the centre row and that will be explained shortly. The Red 7 pays 1x stake for 4 in view and 400x for 14 in view, Green Bar 0.5x/100x. Melon, Grapes or Bell award 1.5x for 5 in view and 50x for 14, the remaining Plum, Lemon, Cherries and Orange 0.5x/25x. You may be wondering why I haven't mentioned the full grid of 15 and is it possible? It certainly is but this is tied in to jackpots and will almost definitely occur only in the game's bonus. Now you will have noticed the middle row of the grid is surrounded by red boxes. Technically these are reels 2, 5, 8, 11 and 14 being as there are 15 different reels on the grid. You need to see 3, 4 or 5 Red Stars anywhere on these 5 single-position reels, or put simply on the middle row. When this happens 10 free games are won and you can't retrigger them but you may have noticed a progressive jackpot amount above reel 5 - this is where the full grid of 15 similar icons becomes important. After triggering you'll see a mini reel spin on the bottom of the game and this will stop on one symbol aside from the Star scatter, like Book of Ra Deluxe does before its free games. The symbol it stops on becomes your only paying scatter for the free games but is sticky, so once you reach the minimum 4 or 5 in view you will be guaranteed to repeat or increase that win on every subsequent spin. The jackpot is seeded at 2000x bet and if the game chooses the Red 7 you can win 100% of the amount by filling the grid, if the Green Bar is chosen then 25%, Melon, Grapes or Bell 10% and the lower 4 icons of Plum, Cherries, Lemon or Orange 5% of the jackpot. The jackpot amount will include all the wins you've accumulated in the free spins before you win it.